So, welcome to the roundtable, kids, and thanks to Peter and Pallas for helping us all get a peek into the way youngsters think about the authors of the books they read. I have tried to imagine and choose a color that would fit the river and the landscape. Warm colors for a hotter climate. Green pages for dense forests. And sometimes the choice is based on the colors in front or after a page, to have a nice variety when you flip through the book. I didn’t visit all the rivers but I wish I had. 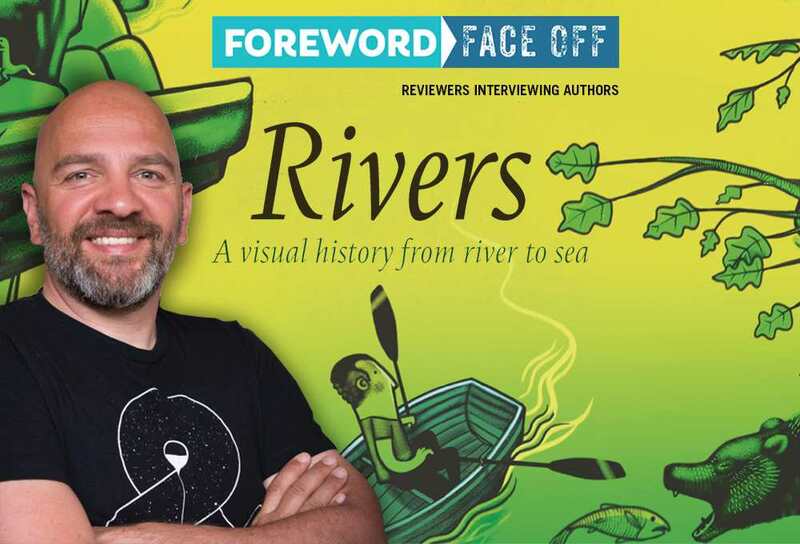 I was lucky to be a travelling company photographer for a while, so I saw a few rivers that are in the book. I like to travel, so I really hope to see them all. I used the internet quite a lot to find pictures but I also used books. My grandfather used to give me big geographical and history books when I was little and I still use them to this day. I also travelled the length of the rivers with google maps and Google street view. You should try that, it’s a fun thing to do. Here is a street view link of my hometown. If you look across the water you can see a castle far away and you can also virtually walk to the caste if you want. Go down to the market and follow the tram rails. I worked on Rivers for a year, almost every day, from start to finish. From deciding which rivers to choose to the last details like choosing the green footboard ribbon. And smooth as a river stone, the good librarian/reviewer steps in to finish the interview. It seems like using the internet to create detailed maps and illustrations is a very modern concept, but on the banks of the Tagus you mention Al-Bakri, a geographer and historian from 11th century Spain who wrote extensively about foreign trade routes while never leaving home. There is definitely a timeless attraction to exploring far away places—would you consider yourself a 21st century Al-Bakri? Maps are exciting. They spark the imagination. They make you wonder about faraway places. In mere seconds you can cover great distances. They give you a perspective of how big the world is. They ground you and give you a sense of your own place and the world around it. Maps also satisfy the need to catalog and put everything in their right place. Order the seemingly chaotic everything. Does that makes sense? Having visited a few of the locations, do you feel like your firsthand experiences and impressions made it easier or more challenging to accurately create those scenes compared to the locations you researched solely through books or online? When you visit a place in real life you have a better feel for what’s going on there. Talking with people, eating local food, visiting the markets, inhaling strange smells. Those are all pieces of the real life puzzle that define a country, an area, and its people. Travel enriches your knowledge and experiences. It even helps with building a picture of places you haven’t been yet. 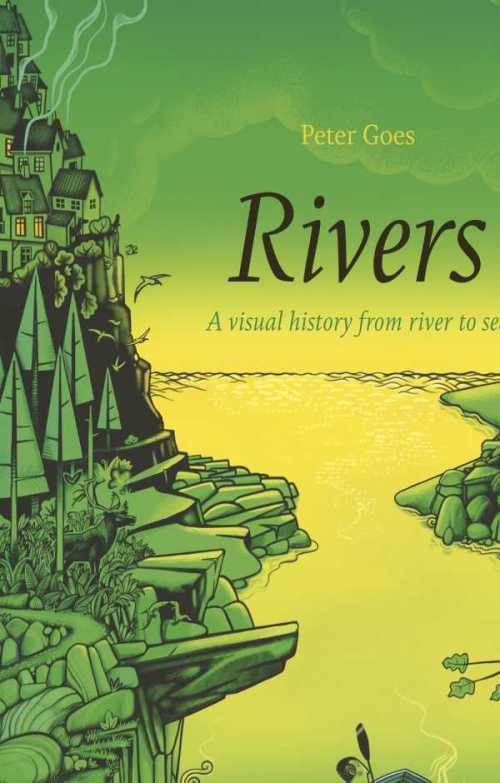 The text and illustrations curve and flow together, bending along with the illustrations, making Rivers a very fluid and visually captivating book. I have noticed with myself and also students who sit to read it that no one is able to stay still while doing so. The lines and curves invite movement—following the text with fingers and hands or moving the whole body, tilting the head, or shifting the book to switch the angle or alter the perspective. Was this something that you anticipated when designing the layout? I like the flow and intertwinement of the text and illustration. I don’t see them as separate identities. They have to work closely together to get the story across. I also like that from a designers point of view, text and illustrations are integrated into the paper. I used dark grey instead of black to lessen the contrast between print and paper. It’s a big book and I see children moving around on top while the book is laying on the ground. I didn’t anticipate that, but it’s great fun to see. The text is full of facts, covering a wide range of topics from history and geography to folklore, mythology, plant and animal life, but it seems as though you had a bit of fun here, as well. There are some humorous additions, such as the location of Antarctica’s secret snowball gatherings and where to find the best fries in the world—your home country, of course. Are there any inside jokes or personal experiences illustrated on the pages that you can share with us? The wide range of topics is the same as a real travel experience where you encounter bits and pieces of knowledge as you go on your way. I also don’t want to speak from the top-down but to invite the reader to join and discover with me. I did include a lot of my friends in all the different places in the world, and it is fun to let them search for their little counterparts. It’s a true fact that Belgian fries are the best in the world. I invite you to come and taste them.